Shown here is the “first light” image of ultraviolet atomic oxygen emission (135.6 nm wavelength) from the Earth’s upper atmosphere captured by NASA’s GOLD instrument. It was taken at approximately 6 a.m. local time, near sunrise in eastern South America. 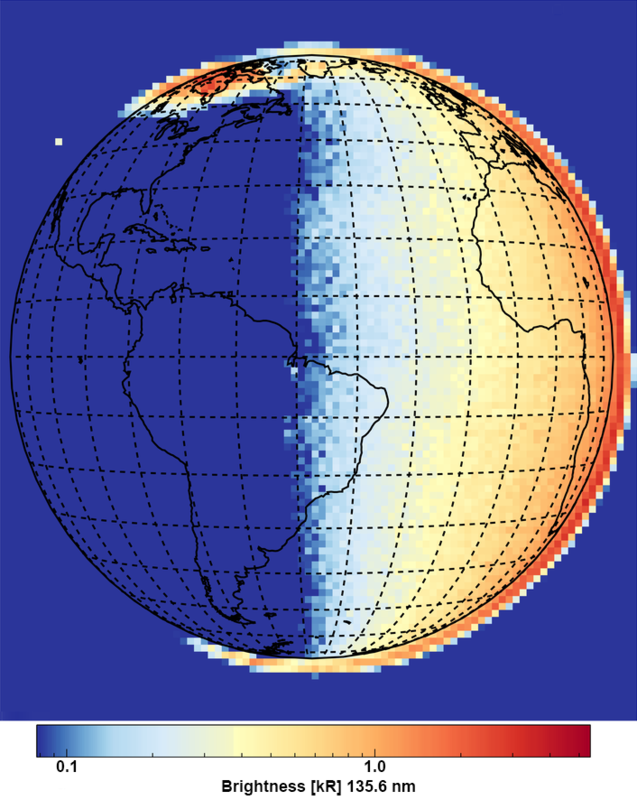 The colors correspond to emission brightness, with the strongest shown in red and the weakest in blue. This unsmoothed image is from one of the two identical channels in the GOLD imager, and it was taken in just under 30 minutes, the routine imaging cadence for the imager. The data have been binned, during ground processing, into pixels that correspond to 125 km by 125 km at spacecraft nadir, and the emission near 135.6 nm selected from the range observed (133-163 nm) by the GOLD imager. This emission is produced at altitudes around 160 km (note how it extends above the Earth’s surface on the horizon), when the Earth’s upper atmosphere absorbs high energy photons and particles. The aurora, at the top and bottom of the image, and daytime airglow, on the right hand side, are also visible. The aurora is seen best at night in the northern latitudes because its location depends on the Earth’s magnetic dipole field, which is tilted southward over North America, and visible just on the southern horizon where the magnetic field is tilted slightly away from the Americas. An ultraviolet star, 66 Ophiuchi (HD 164284), is visible above the western horizon of the Earth.